» FRONTIERS BUSINESS ACADEMY, 2019 – THE TRANSITION! FRONTIERS BUSINESS ACADEMY, 2019 – THE TRANSITION! 1. You will one day transit from paid employment to self-employment and no matter how much money you have to invest, you can lose everything in months if you lack business ownership skills. 2. Paid employment is very different from self-employment. The emotional, psychological, reasoning and bounce back skills are very different and non-transferable. 3. You need to know and understand the right people, methods, materials, money, markets and maturity requirements to build your own sustainable business in any environment. 4. Trusting exclusively, the experience, skills, competence and “loyalty” of your employees to build your business if you have no clue on how things run yourself is too great a risk. You can’t pay human beings enough not to cheat you. 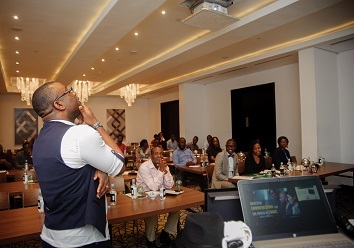 FRONTIERS BUSINESS ACADEMY 2019 is designed specifically to coach and enlighten you on how to successfully transit from paid employment to self-employment and keep building your business with relative ease. 1. Harnessing the material, financial and relational needs for a successful transition. 2. Beyond money, the different capitals you need and how to create them. 3. How to develop a business plan, a business strategy and a model that will work in Nigeria. 4. How to write and sell compelling proposals investors will like and support. 5. How to create and build an efficient and productive team for your business type. 6. The scaling up process from start to becoming a multi-million dollar business in record time. VENUE: The Radisson Hotel, Isaac John Street, Ikeja GRA, Lagos. VENUE: Reiz Continental Hotel, Central Area, Abuja. Lead trainer: Muyiwa Afolabi, a foremost Business and Career coach in Nigeria. Registration closes December 31, 2018. Frontiers consulting, we transform, that’s a promise.